Have Kingston Jamaica Bar & Restaurant Delivered directly to your door! 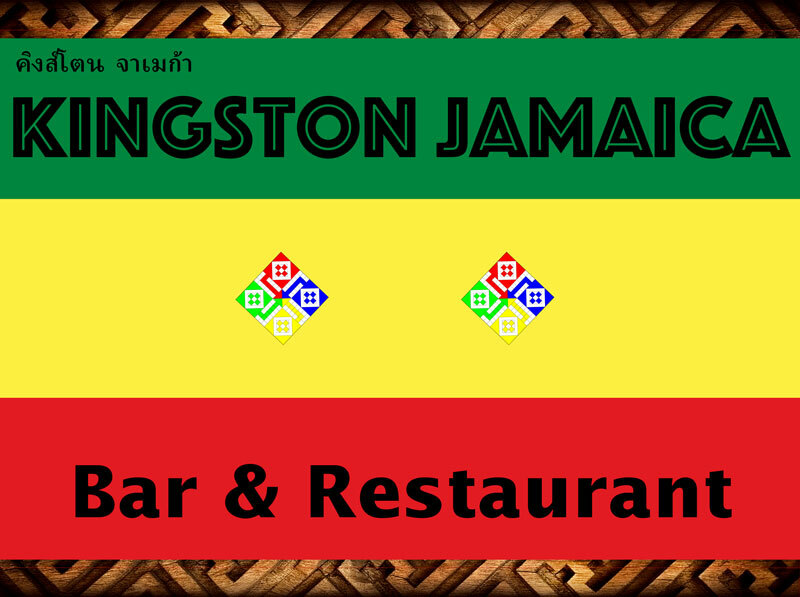 Have	Kingston Jamaica Bar & Restaurant	delivered to you, anywhere on Koh Samui! For only 100 baht! 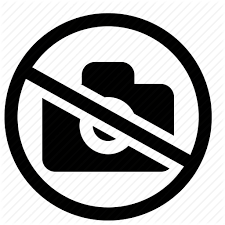 Kingston Jamaica Bar & Restaurant is owned and operated by a Canadian man who was born in Jamaica. Rob Anderson's first cooking jobs were at an American roadhouse style restaurant and a Mexican eatery. That should set the tone for the food experience you will get from us. We cook the food that Rob is experienced at and has a passion for cooking. Wherever possible, we make all the sauces and foods from scratch. We have just redesigned our menu with two main agendas: Great tasting food and value for money. 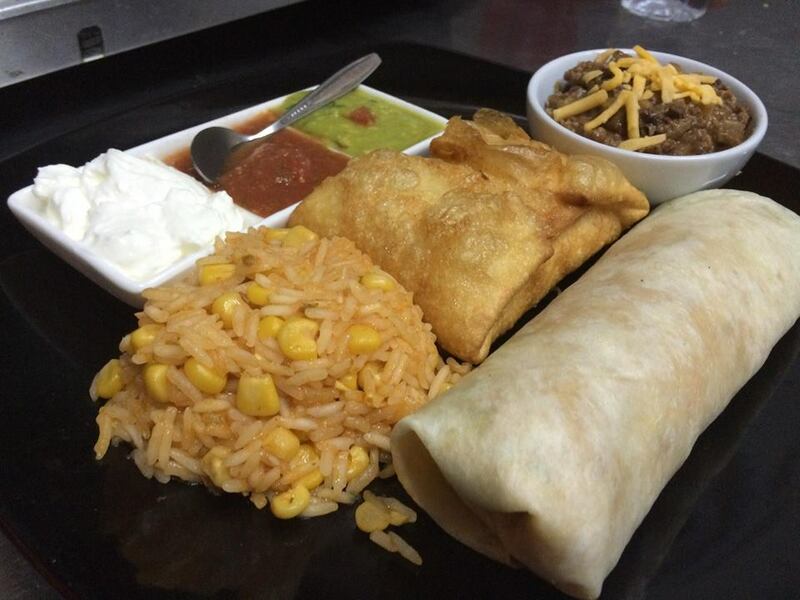 We hope you enjoy our food! Scrambled eggs, bacon, cheese, lettuce and tomato. All fitted inside a tortilla wrap. Served with salsa. 3 egg omelette with chili and cheese stuffed inside. 3 egg omelette stuffed with Mexican chicken and cheese. Served with salsa. Egg, bacon, ham, tomato, cucumber, toast, butter and jam. Two eggs fried into an omelette Thai style. Toasted bread with tomatoes, onions and herbs in a tangy vinaigrette sauce. Toasted French bread sliced and layered with garlic butter. Spicy peppers stuffed with a mixture of cream cheese and cheddar. Breaded and deep-fried to golden brown. Served with sour cream to lighten the spicy heat. 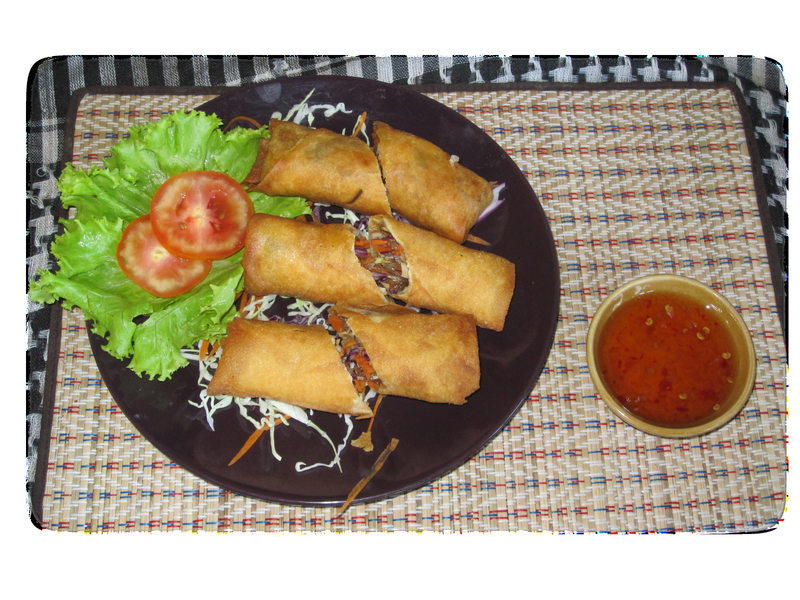 Crispy deep fried spring rolls loaded with seasoned vegetables and glass noodles. 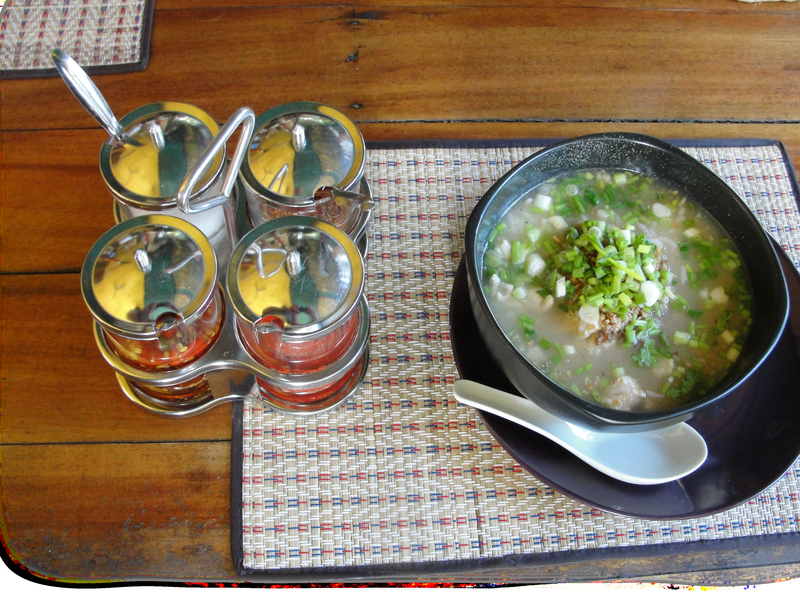 Rice noodles and vegetable soup served with chicken. Coconut soup with mushrooms and chicken. Spicy soup with lemongrass, mushrooms, tomatoes and chicken. Romaine lettuce topped with crutons and bacon. Tossed in our homemade Caesar dressing. Mixed greens topped with tomatoes, onions, bell peppers, crutons and sunflower seeds. 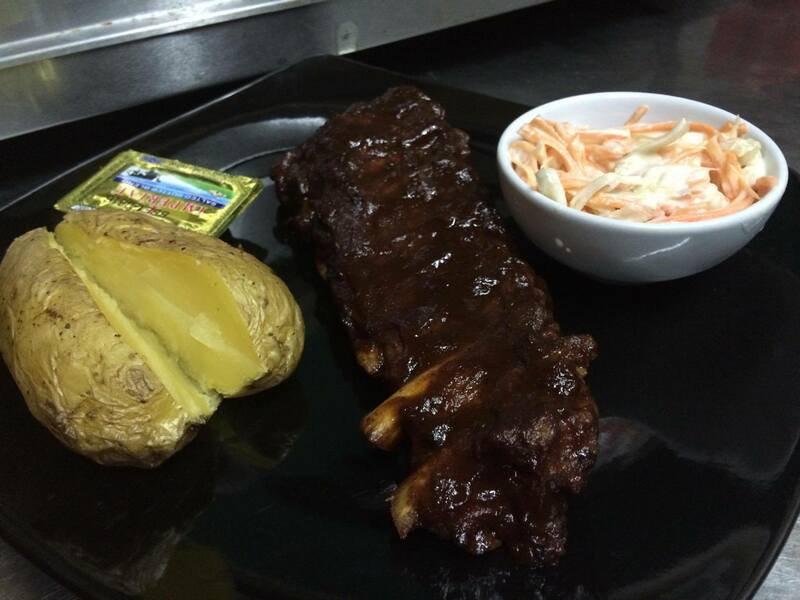 Served with homemade Thousand Island Dressing on the side..
Half rack of fall off the bone ribs glazed in our homemade barbecue sauce. Served with coleslaw and baked potato. Breaded chicken steak fried to a golden brown. Served with salad and French Fries. French Fries covered in Nacho Cheese Sauce and Chili. Mexican style rice with corn and salsa. Crispy wedge fries with cheese and gravy. PInto beans fried with vegetables and spices. Guacamole, sour cream and salsa. Breaded strips of chicken deep fried to golden brown. Served with sweet chili dipping sauce. Crispy fried chicken wings tossed in your choice of sauce. 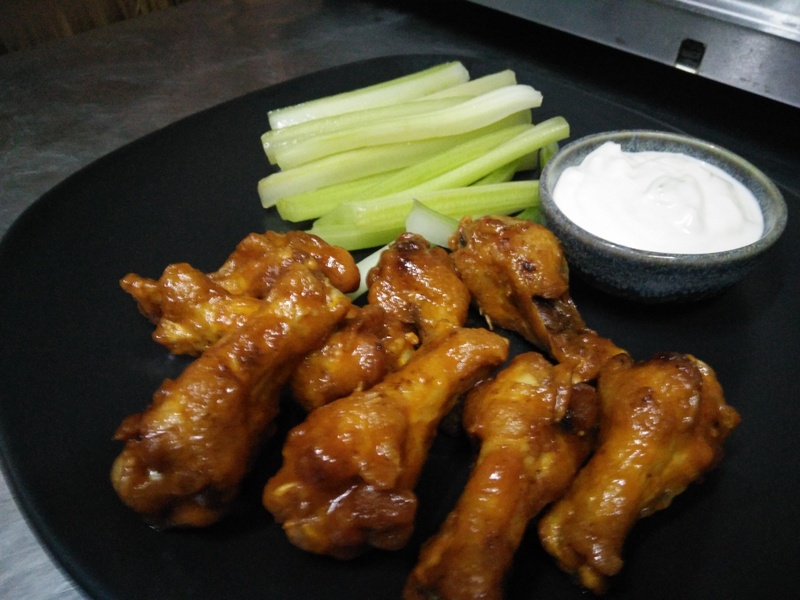 Served with celery and ranch dip. 1/4 pound beef patty topped with cheese, bacon and sauteed mushrooms in cheese sauce. 1/4 pound beef patty served with lettuce, tomatoes and pickles in a burger bun. 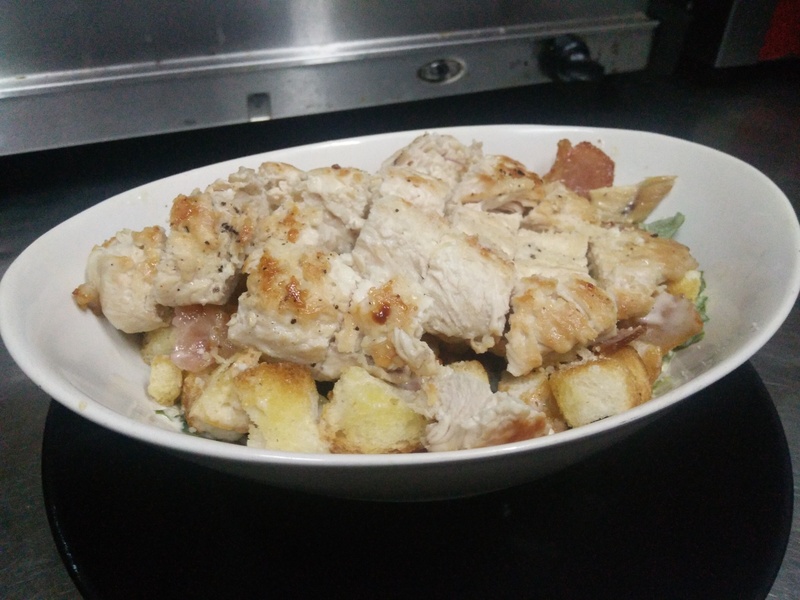 Grilled Chicken Breast topped with sauteed mushrooms in cheese sauce. Grilled chicken breast served with lettuce, tomatoes and pickles in a burger bun. 1/4 pound beef patty topped with cheese, salsa and jalapeno peppers. A full plate of nachos topped with vegetarian Chili, cheese, lettuce, tomatoes and jalapenos. Served with salsa sauce. 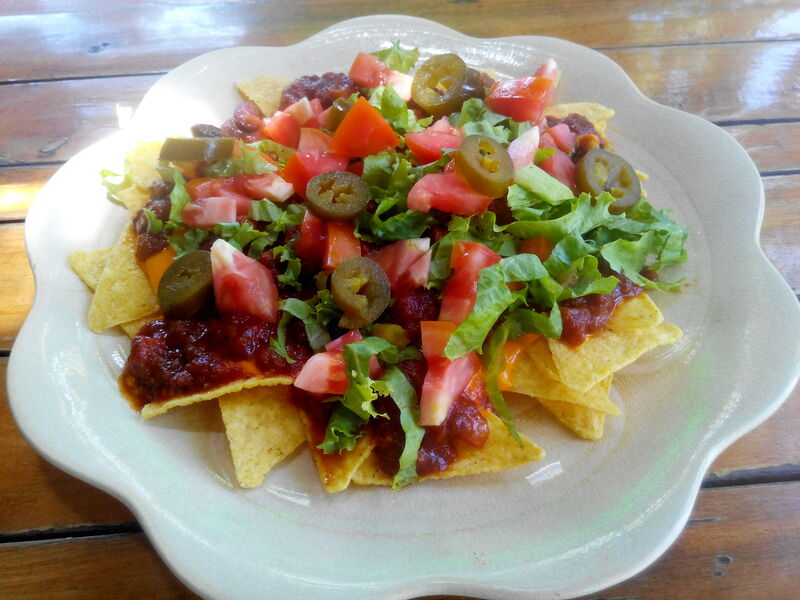 A small plate of nacho chips covered with vegetarian Chili, lettuce, tomatoes and jalapenos. A full plate of nacho chips topped with cheese, lettuce, tomatoes and jalapenos. Served with salsa sauce. 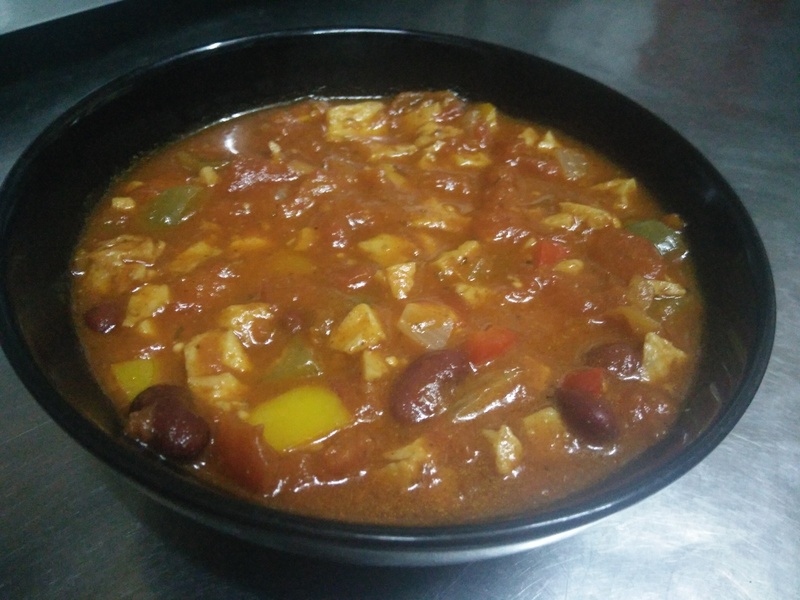 A generous bowl of mushroom based chili. Eight inch tortilla shell fried with cheese in the middle. 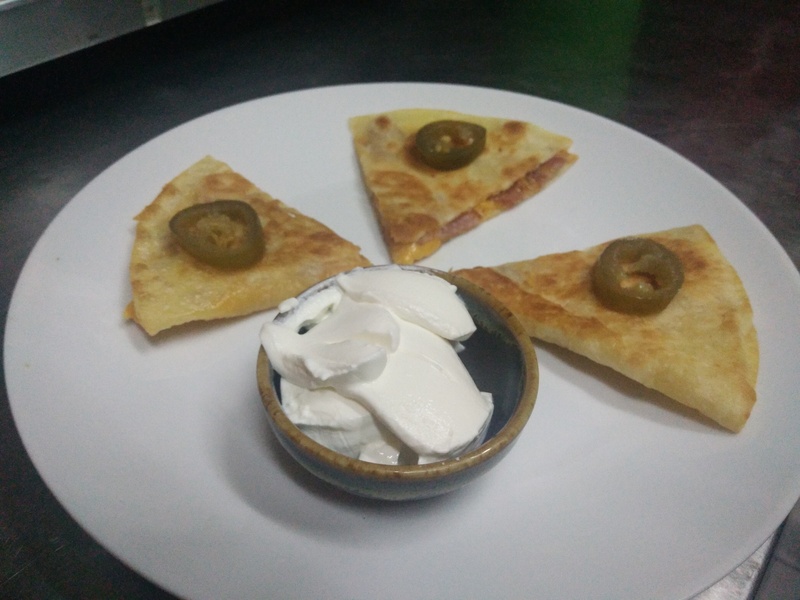 Topped with jalapenos and served with sour cream. 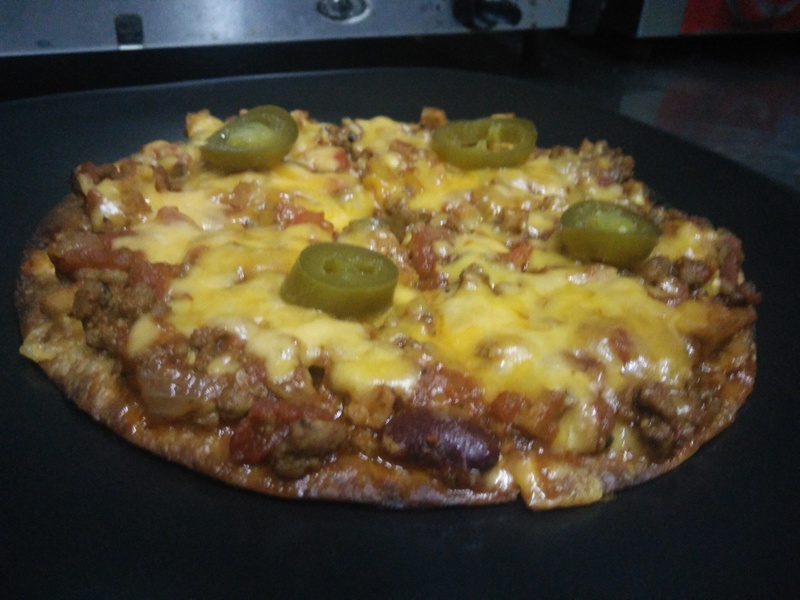 Crispy fried eight inch tortilla topped with vegetarian Chili, cheese and jalapenos. Southern Penang curry fried with vegetables and chicken. Served with rice. Thai style fried rice with vegetables. Holy Basil and chiles fried together with long beans and chicken. Served with rice. 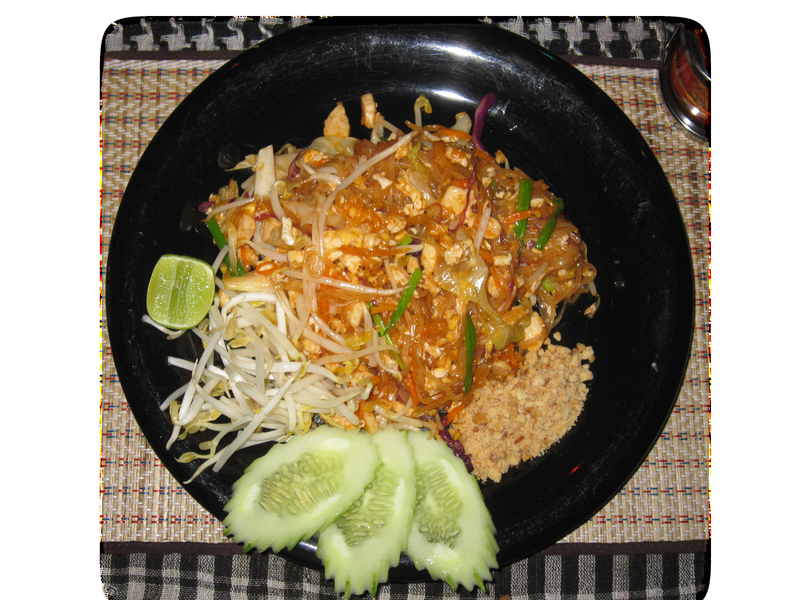 Fried Thai noodles with vegetables. Grilled chicken tossed in Buffalo wing sauce. Topped with blue cheese, lettuce and tomatoes. Grilled chicken topped with lettuce and bacon. Tossed in Caesar salad dressing and topped with Parmesan. Served inside a wrap. Grilled chicken with bell peppers and onions stir fried in fajita sauce with cheese and sour cream on top. Served in a wrap with salsa on the side. Mexican chicken burrito and enchilada. Served with salsa, sour cream, guacamole, refried beans and Mexican rice. Mexican chicken, cheese, lettuce and tomatoes inside a tortilla wrap. Served with salsa, refried beans and Mexican rice. Mexican chicken and cheese deep fried in a tortilla wrap. Served with salsa, refried beans and Mexican rice. Mexican chicken baked inside a tortilla wrap topped with salsa and cheese. Served with salsa, refried beans and Mexican rice. Mexican chicken enchilada and chimichanga. Served with salsa, sour cream, guacamole, refried beans and Mexican rice. Tomatoes, basil and mozzarella cheese, drizzled with balsamic reduction. Grilled in our panini press. Home cured ham covered with cheese, lettuce and tomato. Grilled in our panini press. Shredded chicken breast in a Jamaican Jerk sauce topped with fried onions and peppers. Grilled in our panini press.